In April,2015 a major earthquake struck Nepal. Ecuador is now struggling to cope with the upheaval caused by another. Amidst the devastation, many are beginning to recognize the benefits of using bamboo to strengthen resilience and support recovery efforts. Bamboo is an ideal building material. It is affordable, practical and sustainable, making it an ideal resource to deliver secure and cost-effective housing for the world’s poor. In earthquake-prone regions it offers an additional advantage – a tensile strength that provides resilience and enables bamboo-constructed buildings to withstand tremors. approximately 7000 buildings were destroyed. Many structures built with bamboo, however, remain standing – unlike concrete homes and schools which have largely been destroyed in the worse-affected regions. Initial observations of buildings constructed by INBAR reveal structures that are either intact or have suffered only minor damage – even those located close to the earthquake’s epicenter in Manabi Province. INBAR’s regional office for Latin America and the Caribbean (LAC) is located in Ecuador’s capital, Quito, and the organization has been promoting the benefits of bamboo-constructed homes and shelters throughout the region for many years. A close partnership with officials in Ecuador has resulted in the country including bamboo in its national building codes – giving the housing sector a legal basis that will enable investment and market development. 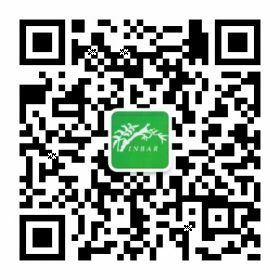 Since the earthquake, as more people have witnessed bamboo’s resilience to earthquake tremors, INBAR’s Team in Quito has been inundated with requests for more information. “The response from people in Ecuador has been incredible,” says Alvaro Cabrera, INBAR’s Senior Programme Adviser for Latin America and the Caribbean. Bamboo is also emerging as a building material of choice in Nepal, which is still recovering from an earthquake that struck exactly a year ago today on April 25 2015, when an estimated 800,000 buildings were destroyed and over 8000 Nepalis lost their lives. In an effort to address Nepal’s post-earthquake housing crisis, a new initiative is harnessing the country’s abundant bamboo resources to rebuild devastated communities and promote sustainable livelihoods. 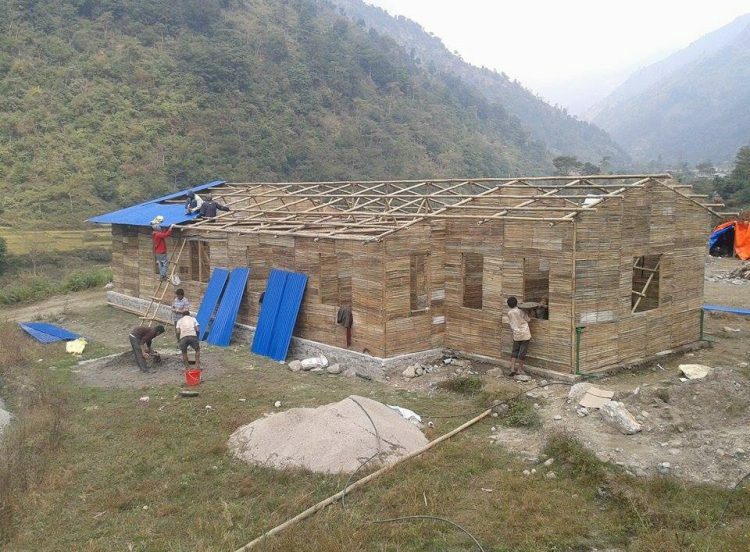 The initiative builds upon a 15-year partnership between INBAR and private sector partners in Nepal that has developed a number of modern bamboo building systems that meet international ISO standards and have excellent anti-seismic properties. These systems and related technologies are now mature and offer an affordable, durable, highly renewable, and rapidly deployable source of building materials for affected communities. One major success of the initiative has been the validation and approval of a bamboo-based school design. As a result of the earthquake, Nepal’s education sector faced significant damage and lost more than 9000 schools across 59 districts, affecting more than one million students. 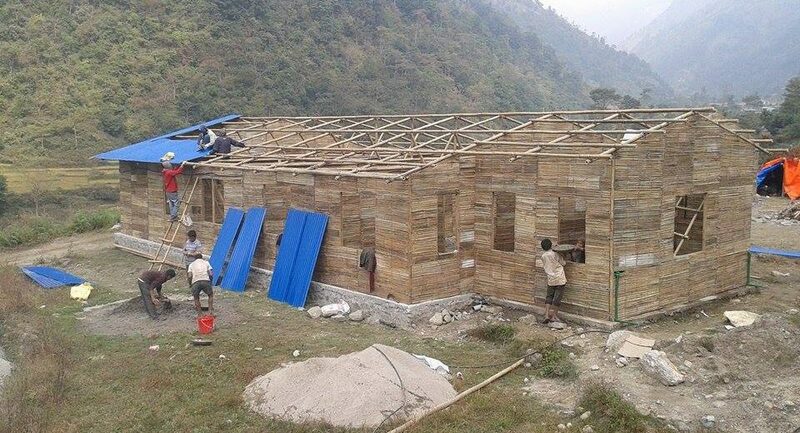 Moving forward, after the completion of an initial ten bamboo schools this year, Nepal’s government plans to use bamboo in the construction or upgrading of 8000 schools over the next three years. Nepal and Ecuador face an uphill struggle and their recovery efforts could take many years. But, both have ample bamboo resources – a strategic resource that could be harnessed to strengthen each country’s resilience and support their sustainable development.